"HIGH POINT, N.C., Aug. 30, 2016 – High Point University awarded five Say Yes Scholarships to Guilford County Schools students for the 2016-17 academic year, including two scholarships dedicated to students who are the first in their family to pursue a college degree. The scholarships cover full tuition, fees and books for four years. 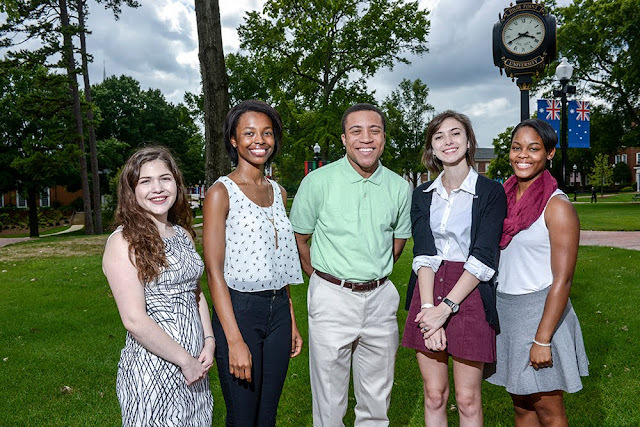 While the national Say Yes Scholarship program is new to Guilford County, this is the seventh year HPU has awarded First Generation Scholarships, for a total of 14, four-year scholarships awarded so far. HPU’s Class of 2020 recipients are Douglas McCollum, Kayla Quick, Emily Yacuzzo, Mary Hannah Shinn and Natalie Lucas. Douglas McCollum is a Say Yes Scholar and First Generation Scholar who grew up in the city of High Point. He’s a graduate of High Point Central High School, where he participated in JV basketball, track, the International Baccalaureate Program and served as president of the Poetry Club. He’s also a skilled Ju-Jitsu athlete. Kayla Quick is a Say Yes Scholar and First Generation Scholar and a graduate of Southwest Guilford High School. She was a varsity cheerleader during her time at Southwest, as well as a member of the Beta Club, the National Honor Society, Chorus, the Baking Club and a service learning ambassador. She has also volunteered her time for the Miracle League of High Point, the Ronald McDonald House and served as a reading buddy at Shadybrook Elementary School. She plans to study psychology and criminal justice at HPU. Emily Yacuzzo is a graduate of Penn-Griffin School for the Arts, where she played flute in the concert band, was a member of the theatre program, the Art Club, Beta Club and the National Honor Society. Through the concert band, she and her team members traveled to play music for students with special needs at schools throughout the Triad. At HPU, she’ll major in political science. Emily Lucas graduated from Penn-Griffin School for the Arts and served as the co-president of the Ukulele Club while focusing her studies on classical guitar. She played in the school’s guitar ensemble, which performed for a variety of groups, including people battling cancer at High Point Regional Hospital and residents at Adams Farm Living and Rehabilitation. She also volunteers at a number of local festivals. Mary Hannah Shinn graduated from Weaver Academy in Greensboro. She was a member of the National Honor Society as well as the National Art Honor Society. She served as a docent at the Greensboro Natural Science Center, was a volunteer soccer coach and cheer coach at Cheer Elite All Stars. “I will be a biology major, and I’m most excited about the experiences I will have and the learning opportunities I will have throughout my time here,” Shinn says."